Camassia (Quamash, Camass, Indian hyacinth, Wild hyacinth) are hardy bulb plants native to North America and are members of the Lily family, Liliaceae. All members have long lance shaped leaves and bear spikes of pretty blooms resembling lilies in early summer. They are suitable for planting in beds, borders along watersides and naturalizing on the edge of woodlands. The plants thrive in ordinary garden soil and even do well in locations where the soil is rather boggy. Propagation is done by planting bulbs or by sowing seed. 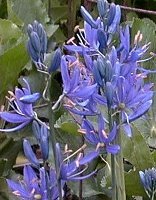 Camassia plants dislike being disturbed once they begin to grow, so it is best to plant the seeds in a location or in containers in which the young plants can remain for a couple of seasons. The seeds require stratification to break dormancy and this may be accomplished in two ways. The first is to allow nature to stratify the seed for you. Plant the seeds in late fall in a bed prepared with finely worked slighty sandy soil. Sow the seeds thinly, about 1 seed every 3 inches each way. Cover lightly and allow Ma Nature to do her work. The seeds should germinate in the spring as outdoor temperatures warm. To artificially stratify, sow the seeds in pots, trays or a bed prepared with a sandy soiless seed starting medium (1 part sphagnum peat moss to 2 part sand is fine). Sow the seed and cover lightly. Keep the medium moist, but not soggy. Maintain temperature at about 40F for about 4 weeks, then raise the temperature to about 70F. 2 year old seedlings may be transplanted to an outdoor location as soon as ambient temperatures remain above 55F.